Ooh, Look at the pretty lights! 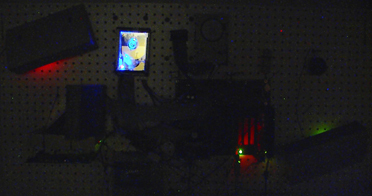 I finally figured out what I could change on the pegboard computer! It didn't have lights! How could I use it when the lights were turned off? Instead of doing something wussy like turn the lights on, I decided to strategically place a few lights on the board. Everyone likes lights right? Right? First thing I did was test the voltage coming out of the power source. 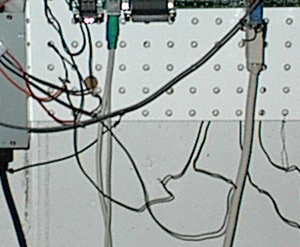 As you can see in some of the pics below, there are four wires in the standard configuration. 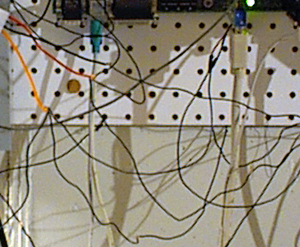 Two are black grounds (in the center), one is red (5V), the other is orange (12V). Along the way, I found out that you can perform a really hard shutdown by shorting the orange (yellow in some PCs) and the red! That probably isn't the healthiest thing for me to do to the computer, so I decided to stop shorting things before I damaged my $30 ATX power supply. That would be a truly tragic event. Before I installed any lighting, I decided to finally install a power switch. 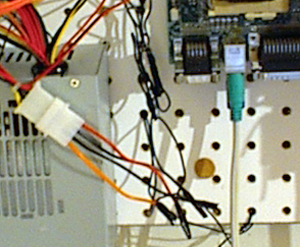 If you have read the sections, you know that I have been shorting two pins on the motherboard in order to start the PbC. To accomplish this, I bought a small momentary switch. I then went through a pile of things from stuff I dismantled and found a plug that had the right pin config. I cut off the useless end, stripped the wires, then soldered the wires to the switch. When plugged in, the switch worked like a charm. Now I happily have a reset switch and a power switch. Much more convenient. 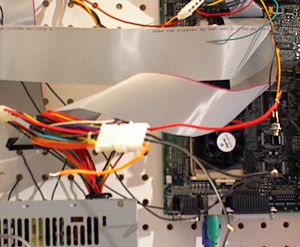 I looped the cable through one of the straps on the floppy drive to keep it suspended above the motherboard. My trip to Radioshack landed me with a blue LED, three 12V LEDs (2 green, 1 red), a blinking red and a blinking green LED. I spent all kinds of time then placing the lights in various positions to see how they looked. The first light I decided on was one in the HDD. Since I had cut holes in so many HDDs I decided a light would be a welcome addition to this drive. Blue lights in HDDs look very cool in the dark. All those reflective surfaces make for lots of blue. 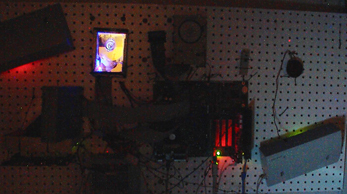 The next couple of lights I placed were next to the PCI cards. One faced forward through a hole in the motherboard. 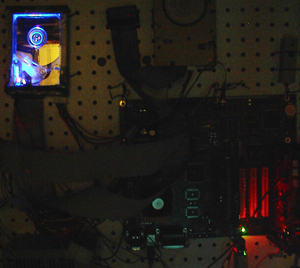 I nestled the other LED in between two chips on the video card facing upwards. 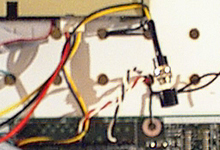 The next light was placed above the CD-ROM's controller card facing down. I mounted the two blinking lights behind the speakers so that the light would be diffused somewhat by the curved surface of the speaker. Next came the fun part, I got to solder all the LEDs to the power source. For the first part, I bought an extension for computer power cords and cut it in half. 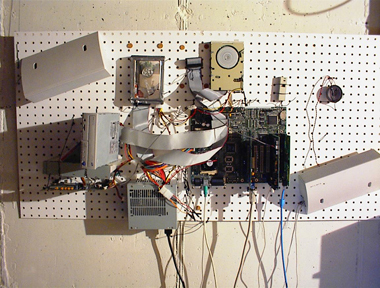 I then cut and stripped wires in the appropriate sizes and weaved them through the pegboard to their respective destinations. That's the end of this newest PbC update. There will be an update to this section when I finally finish the thing I am currenctly playing with.